In the wake of the events in Charlottesville, VA, we'd like to share three pieces to help our community process, respond, and commit to further action. The events in Charlottesville, Virginia last weekend, the images from those events left me with many feelings: deep sadness and fierce anger at the images of hundreds of white men and a few white women touting Nazi flags, confederate flags, and crosses. I also felt conviction, hope, and pride when I saw that wall of clergy standing strong, being the hands and feet and bodies of Christ. I've mentioned before that part of my job as a hospital chaplain is to be a theologian of the cross. That is, to call a thing what it is and not what the world might want it to be. In this moment we must call a thing what it is: Racism – that being a mix of power, privilege, and prejudice – is sin. Racism is evil. Anti-Semitism is sin. To equate anti-racist groups and demonstrators with white supremacist groups and demonstrators is sin. White supremacy in all its covert and overt forms is sin. We as the church have the baptismal responsibility to renounce evil in all forms. Together we renounce this evil. Throughout each of Scripture readings for this last Sunday, the expansiveness of God's love and justice shined through. In the struggle of rebuilding a devastated nation, Isaiah told us that God's house is a house of prayer for all people. Paul said to us in Romans that God is merciful to all. And in Matthew, a persistent woman called Jesus out to receive abundant mercy. Expansiveness, Inclusiveness, Persistence. In the gospel reading, Jesus reminded his disciples that it is not what goes into the body that determines the character of an individual. Rather, it is what comes out of one’s mouth which proceeds from the heart – that is what defiles a person – or what shows a person's character. Then, we saw Jesus’ very human self come forward as he denied mercy to a woman whom he did not understand to be “like him” or “one of his.” Nevertheless, she persisted. This woman knew better and she was persistent, she was vigilant, and she knew the truth. Do not even the dogs eat the crumbs that fall from their master's table? She wasn't even asking Jesus for a seat at his table – she was calling him out on the truth of God's love in God's kingdom – there is more than enough for all. And in recognizing the truth spoken to him, Jesus modeled holy transformation for us. Are we not in this moment called to be like this woman? Persistently challenging the assumed privilege in our nation? Boldness, bravery, stubbornness – perhaps these are the characteristics of faith we are being called to manifest so that transformation of ourselves, our neighbors, and our systems might occur. Many of us in the ELCA are given privilege in our country because of the color of our white skin. May we lovingly persist in confronting and dismantling racism in ourselves and those we love. May we boldly denounce, speak against, and act against overt racism. And when those oh-so-easy-to-brush-over covert signs of white supremacy pop up - like confederate flags, a denial of white privilege, claiming colorblindness, and believing that good intentions are good enough – may we with boldness and love speak God's truth to our complicit selves and our neighbors. And may we have open hearts when our truth-telling neighbors are bold to confront us. Perhaps one of the most disturbing images I came across this week was a social media post of a photo of the torch-wielding white supremacists in Charlottesville with Matthew 5:16 quoted above it: “Let your light shine before men, so they may see your good works and praise your father in heaven.” It broke my heart because in looking at it, I could not hide from the fact that the Church has throughout history been an active participant in building walls that separate people and in pushing those on the margins even further out. This is antithetical to the gospel. I pray that we are emboldened by Christ's love to persistently pursue justice. Christ has given us the grace to be his fresh-creation-agents and he has shown us that transformation of hearts is possible. So when we come to the table each Sunday, may we be reminded of what we are - the body of Christ, the hands and feet of Christ. Be strengthened and emboldened with that knowledge to persist in hope, faith, and justice. Amen. Advent Lutheran Church and the Evangelical Lutheran Church of America (ELCA) reject white supremacy in all its forms. Racism, overt or covert, is antithetical to the Gospel of Jesus Christ. We commit ourselves to reject and dismantle white privilege, white supremacy, and racially biased systems and institutions. This includes spending time in personal reflection and accountability as we come face to face with our own racism and bias. 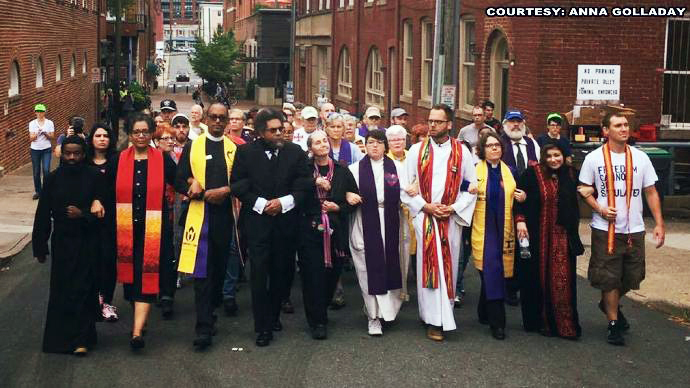 As the days following Charlottesville, VA turn to weeks and then to months, we, as Advent, commit ourselves to the long journey ahead. We pledge to not forget or fall away. It is our call as Christians to work for peace and justice throughout the world and that is what we will continue to do. In the coming weeks, look for opportunities through Advent to engage the topics of racial inequality and justice-making. If you know you are interested in joining future studies, events, and advocacy opportunities, please let us know so we can make sure you are in the loop. We invite all Advent members and friends to join the "Yes to Love, No to Hate: NYC Interfaith Gathering of Solidarity, Hope, and Action" tomorrow (Wednesday, August 23) at Fourth Universalist Society, 160 Central Park West from 6pm-7:30pm. Here is a link to the Facebook event. Please invite your friends and share widely. We need each other. We need to declare together, across differences of faith and race, that there is no room for hate in our congregations, in our city and in our nation. Join us.